Kobe. Laid down at Kawasaki shipyard as a 6,178 ton passenger-cargo ship for the Osaka Shosen Kaiska (OSK) Line. Launched and named SEATTLE MARU. Completed. She can accomodate nine 1st class, 46 2nd class and 395 3rd class passengers and carries a crew of 107. SEATTLE MARU is placed in service on OSK’s Hong Kong ~ Kobe ~ Tacoma route. 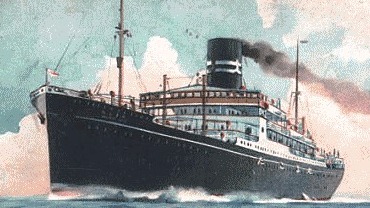 Departs Hong Kong on her maiden voyage to Tacoma, Washington carrying many immigrants to North America..
SEATTLE MARU is transferred to OSK’s South American route. She carries many Japanese immigrants to Brazil and Peru. Departs Kobe on No. 3 Emigrant Voyage. Departs Kobe on No. 6 Emigrant Voyage. Departs Kobe on No. 8 Emigrant Voyage. Arrives at Ellis Island, New York from Fowey, England. Disembarks 87 Japanese passengers. Departs Kobe on No. 21 Emigrant Voyage. Departs Kobe on No. 28 Emigrant Voyage. Departs Kobe on No. 33 Emigrant Voyage. Departs Kobe on No. 41 Emigrant Voyage. Transferred to OSK’s Japan ~ Calcutta route. Transferred to OSK’s Japan ~ Southwest Pacific route. Placed on OSK’s Kobe ~ Dalian (Darien), Manchuria route. SEATTLE MARU departs Ujina and arrives at Moji. SEATTLE MARU and 32 other transports participate in a landing at Hangzhou Bay, China. Returned to her owners and placed on OSK’s Osaka ~ Tsingtao route. Arives at Nanking (Nanjing), China on the Yangtze River. Requisitioned by the (IJA) as a troop transport. Probably painted overall grey and armed with AA guns. Carries troops to Saigon, South Indochina and Haiphong, North French Indochina. Enters dock. Undergoes hull cleaning. Arrives at Whampoa (Huang Po) River, near Shanghai and departs that day. Enters dock. Undergoes hull cleaning. Probably converted to a hospital ship and repainted overall white with green horizontal stripe around thehull and red crosses on the sides and funnel. Arrives at Kirun (Keelung), Formosa (Taiwan). Arrives at Ujina, Hiroshima Prefecture. The 6th medical group embarks patients for transport. Departs Dalian. Arrives at Pusan and departs that day. Departs Ujina and arrives at Pusan. Departs Pusan and arrives at Ujina. SEATTLE MARU runs aground, but is refloated and arrives at Moji later that day. Arrives at Ujina. Unloads and departs. Japan's Ministry of Foreign Affairs issues an official notice to all belligerent countries that SEATTLE MARU is employed as a hospital ship. Arrives at Hong Kong. Departs that same day and arrives at Kirun. Departs Kure. Calls at Chejudo (now Jeju-do) Island, Korea, Moji and Osaka. Arrives at Chongjin, northern Chosen (Korea) and departs. Arrives at Saigon, French Indo-China and departs. Arrives at Dalian (Dairen), Manchuria. The 7th medical group embarks patients for transport. Departs Kirun. Arrives at Moji, disembarks patients and departs. Arrives at Ujina and departs that same day. Arrives at Manila and departs that same day. Arrives at Rabaul, departs and arrives at Kokopo, S Rabaul, New Britain. Arrives at Rabaul, departs and arrives at Kokopo. Departs that same day for Palau. Arrives at Rabaul and departs. Arrives at Ereventa, Bougainville Island, Solomons and departs. Arrives at Rabaul and departs that day. Arrives at Kokopo, departs that day and arrives back at Rabaul. At 1500, SEATTLE MARU departs Takao for Moji in convoy No. 227 also consisting of HORAIZAN, GYOKUREI, KENREI, NIGITSU, NIKKO and HOREI MARUs, and KOTO MARU No. 2 escorted by minelayer NUMAKAZE. Arrives at Kirun (Keelung). ORYOKU and TEIYO MARUs join the convoy. NIGITSU MARU probably is detached and steams to Palau. 50 miles ENE of Naha, Okinawa. LtCdr (later KIA) John A. Moore’s (USNA '29 ) USS GRAYBACK (SS-208) (later lost in action) torpedoes and sinks NUMAKAZE with all hands at 26-29 N, 128-26 E.
At 2130, USN codebreakers intercept and decrypt another signal that reads: : “NUMAKAZE under tactical command commander DesDiv 1 left Takao escorting convoy No. 227. Route Moji. On 18 December at 2130 in position 26-30N, 128-13E reported sighting enemy submarine and depth charging same. Since then, nothing has been heard from said vessel. ----. A large quantity of material washed ashore at Betozaki in Okinawa. Departs Kanagawa and arrives at Galera. At 0300, SEATTLE MARU departs Takao in convoy TAMO-12 also consisting of HAKOZAKI, FUSO, KUROGANE, YOZAN, CLYDE, CHINZEI, SHINYO, MISAKI, SHINKOKU (cargo), KAIKO, TSUKUBA, SAINEI, SHONAN and YAMAHAGI MARUs escorted by destroyer KURI and patrol boat PB-38. KAMO MARU and an unidentified ship joins from Keelung and KAIKO MARU and six other unidentified ships split away from the convoy and depart escorted by KURI. At 0845, arrives Reisui Bay, Korea and anchors. Embarks personnel including replacements for Southern Army, 3rd Air Army HQ personnel, 6th and 7th Independent Maintenance Units (repair specialists for the IJA Type 3 “Hien” ("Tony") fighter of the Manila Air Depot, 63rd Anchorage HQ and 75th and 85th airfield battalions. Departs Fusan. Arrives at Ujina. Probably loads additional troops. At 1245, SEATTLE MARU departs Miike, Kyushu for Takao, Formosa convoy MOMA-02 also consisting of SHOZAN, JINZAN, TOKUSHIMA, HIZAN (HIYAMA), KOKKA, YASUKUNI and RYOFU MARUs escorted by destroyer HATSUSHIMO, kaibokan CD-1, CD-22 and minesweeper W-34. At 1900, SEATTLE MARU departs Takao for Manila in convoy TAMA-21C also consisting of MANTAI, MITSUKI, JINSAN, YASUKUNI, TENSHIN, YAMATAMA, SAINEI, HIZAN (HIYAMA), KOKKA, SHOZAN and SHOEI MARUs and tankers SHONAN, MITSU, AYAGIRI and AYAZONO MARUs escorted by kaibokan KUSAGAKI, CD-1, CD-22 and minelayers MAESHIMA, ENTO and minesweeper W-34. At 0946, LtCdr Harold E. Ruble's (USNA ’33) USS PIRANHA (SS-389) torpedoes and sinks SEATTLE MARU at 19-17N, 120-15E. The ship was carrying 4, 285 IJNAF personnel. Among the units carried by SEATTLE MARU was the 6th and 7th Independent Maintenance Units, Manila Air Depot. HIYAMA and SHOZAN MARUs rescue 3,489 men or all but 296 of the embarked officers and men, 25 gunners and 45 crewmen. Over the next six hours, Captain (later Rear Admiral-Ret) William V. O'Regan’s (USNA ’23) wolf pack, nicknamed the "Mickey Finns", consisting of LtCdr Duncan C. MacMillian's (USNA ’26) USS THRESHER (SS-200), LtCdr (later Rear Admiral) Novell G. Ward's (USNA ’35) USS GUARDFISH (SS-217) and Ruble's USS PIRANHA closes in and decimates the convoy. At 2300, MacMillian's USS THRESHER torpedoes and sinks SAINEI MARU at 18-53N, 119-32E. 21 troops and passengers on board, and three crewmen are KIA. At 2350, Ward's USS GUARDFISH torpedoes and sinks JINZAN MARU. 38 troops, one passenger, seven gunners, two watchmen and three crewmen are killed – a total of 51 dead. Two minutes later, Ward torpedoes and sinks MANTAI MARU. 72 military passengers and 43 crewmen are KIA. The attacks continue. At 0034,Ward's USS GUARDFISH torpedoes and sinks HIYAMA MARU her decks full of Type 95 light tanks, motor vehicles, equipment, and ammunition. The ship was loaded with 101 troops of the 12th Independent Tank Regiment of whom four along with four of the crew are KIA. W-34 and CD-1 rescue survivors. At 0345, MacMillian's USS THRESHER torpedoes and sinks SHOZAN MARU at 18-50N, 119-43E. 125 soldiers, 64 crewmen 24 gunners and about 500 of SEATTLE MARU survivors are KIA. CD-1 and W-34 rescue the survivors. Thanks go to John Whitman of Virginia and Fontessa-san of Japan for info on 1937 in Rev 1.